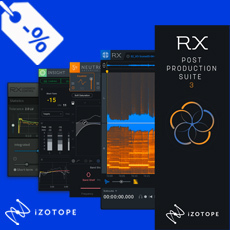 iZotope kicks off the RX Sale, all products of the RX Series as well as Insight & Neutron 2 Advanced are drastically reduced throughout April! Music Rebalance - Music Rebalance is a powerful tool that intelligently identifies vocals, bass, percussion, and other instruments in a mix and allows for independent gain adjustment of each element—you can even isolate or remove vocals. Repair Assistant - Representing the latest advances in iZotope's assistive audio technology, Repair Assistant is a game-changing intelligent repair tool that can detect noise, clipping, clicks, and more. Variable Time - Adjust the time stretch amount of an audio selection without altering its pitch. Es ist erstaunlich was man mit heutiger künstlicher Intelligenz machen kann. Das RX7 ist sehr hilfreich für mich im Postprobereich Audioprobleme anzugehen. Voice, Instrumentenisolation und Rebalancing finde ich nun in dieser Version absolut toll. Danke dem Entwicklerteam von iZotope! Erhoffe mir noch etwas bessere DAW Unterstützung für Nuendo, Handhabung etwas kompliziert. Ich habe damit gerade drastisch die Geräusche eines Beamers bei einem Videodreh auf den Audiospuren reduzieren können. Die Waffe! Audio Unit (32 & 64-bit), AAX (64-bit, real-time), AAX-AS (64-bit, Audiosuite), RTAS (32-bit, real-time), DPM-AS (32-bit, Audiosuite), VST 2 (32 & 64-bit), VST 3 (32 & 64-bit).